For listening to music at home I use an Apple TV plugged into my fancyish sound system, and so I use music stored in lossless format. Since I use an Apple TV this music is stored on a computer using iTunes. I also have an iPhone, and my music library is on there too, but I can’t fit my entire lossless library on there (it’s more than 100GB) so up until now I’ve also kept a totally separate iTunes library, on a different computer, with the same music in 128kbps AAC format that can fit on my iPhone. I tried this out last week. 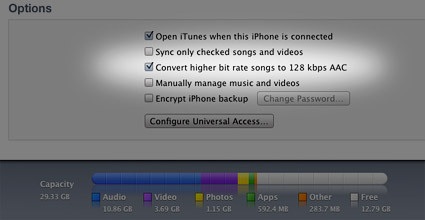 It definitely works, but takes a long time, about 15 hours syncing from my ~4 year old iMac. I can live with that slowness though now I don’t have to look after 2 separate libraries and manually convert all my music to smaller formats myself.